Pedialyte is by far my go to for rehydration during flares and hot days. Each liter gives you a whopping 1,000 mg of salt. I stick with unflavored because of MCAS-like issues, but usually flavor with a scoop of Ultima or Vega (both listed below). Tastes pretty decent too! The Good: lots of salt with little other ingredients to worry about. Works EXTREMELY fast. BP stays above 100 systolic with this amazing drink. The Bad: Hard to find during flu season and extremely expensive. Cheapest is through Walmart.com for about $4.50 each bottle. Contains sugar (dextrose). Walmart’s knockoff of Pedialyte. Has the exact same chemical composition as Pedialyte so it will work just as well! The Bad: Taste is God awful plain. But that’s OK, if you are desperate like me, you will be chugging through this stuff too quickly to really notice, especially if you flavor with Vega or Ultima. Also it goes in and out of stock quite often. Contains sugar (dextrose). If you want some sort of taste without having to add another powder or flavoring, but don’t want artificial dyes, this is the drink for you. Almost the same composition as Pedialyte and you will get your salt fix in with some good tasting drink. Available in Berry and Citrus flavors. The Good: Flavored without artificial dyes and flavorings. Price is OK, $4 a bottle from Target or Kroger. Good source of salt and potassium. The Bad: Kind of a strong flavor, sometimes I do half of this stuff and half water to dilute it out a little bit. Not available from sources outside of Kroger or Target. Contains sugar (organic dextrose). If you don’t want to lug around liters upon liters of fluids on the go and want to save bottles, Normalyte is for you. A little bit less sodium than the choices above, but the convenience is very very nice. Also has a good source of potassium. The Good: No artificial dyes and flavorings. Very convenient and great taste. Cost is a lot cheaper per liter than the drinks listed above. Available at Walmart and Amazon at $9 a box, around $3 a liter. OR buy directly from Normalyte in bulk and get amazing discounts. The Bad: If you use a lot, you will be going through a lot of these boxes. I wish they had a jar with a scoop for the powder. Contains sugar (dextrose). If you want to save some major BANK, choose Trioral! It also has the highest amount of sodium per liter that I have seen yet… a whopping 2.6 grams per liter. The Good: Exactly the same as Normalyte, but each packet is for a liter versus 500mL and there is more sodium. Also, it is only 40 CENTS a liter. You can buy 100 pack boxes from Amazon, which is what I use for a month’s supply for POTS. The Bad: Absolutely none, unless you don’t need that much sodium. Also contains sugar (dextrose). This is an amazing zero calorie, zero sugar electrolyte powder. It is also pretty affordable compared to the others, but the salt content is a LOT less, only 100mg per scoop. However, it might make it a good electrolyte option for people with HyperPOTS. Contains a hefty amount of potassium, compared to other brands at 400mg a scoop. This is not an effervescent drink. The Good: The mixed berry has a pretty good taste. Comes in single serve packets for travel. Available at Whole Foods and through the Vega website, but is cheapest through Amazon subscription, for about $22 a bottle (40 servings a bottle). Zero calories and sugars. The Bad: Has a slight chalky texture and is sweetened with stevia, if you are not a stevia fan. The lemon-lime flavor is OK at best. Ultima is also a great choice for people who want an electrolyte powder without all of the sugar and calories. This is not an effervescent drink. Comes in a lot of different flavors, so you won’t get as tired of the taste. Has less potassium than Vega (250mg/scoop) and way less sodium (55mg/scoop). HyperPOTS people could consider this as a potential option as well. The Good: Cheapest of all the options listed here per scoop. Can find for about $30 for a 90 scoop jar on Amazon. Also available at Vitacost.com and Wholefoods. Many flavors. The Bad: Sweetened with stevia, if you are not a fan. Also, the grape flavor upset my stomach a bit, but I had no problems with the pomegranate and the raspberry. I have recently started experimenting with this electrolyte powder (grape flavor). It has a great source of potassium, but also other ingredients not used in the other electrolyte powders, such as D-Ribose, taurine, creatine, and niacin. I have to say, it has helped some with my fatigue, so I have been using this powder almost exclusively recently. The Good: Great source of potassium, with 580mg/scoop! Zero sugars and is sweetened with stevia. Has three different flavors, including an unflavored. Has other ingredients used to help with energy levels. The Bad: Somewhat expensive. With my functional doctor, I can get it at $24/box. But it usually will even out to be about $1/scoop for most people. Since I do about 2 scoops/day, this does add up. Also, it seems that the unflavored is always out of stock. Although this seems to be a POTS community favorite, I am actually not a fan. They create an effervescent drink, which I don’t typically like. It is, however, a pretty affordable option and comes with many flavor choices. Has the lowest amount of potassium (100mg/tablet), but more sodium than the others (360mg/tablet). Contains sugar (dextrose). CAREFUL: NUUN also has a line of tablets with caffeine added to them. Be careful when buying that you don’t buy the ones with the caffeine added! The Good: Lots of options and easily portable. Available at Whole Foods and Amazon.com for about $23 for 4 tubes (40 tablets). The Bad: Creates a bubbly drink (I am personally not a fan of those). Also contains more side ingredients, like avocado oil, which may be problematic for people with MCAS. A lot of POTS patients swear by Gaterade, but I haven’t seen as much success with Gaterade as with Pedialyte in a real POTS crisis for the salt or with the electrolyte balance as with Ultima or Vega. A lot of doctors will recommend Gaterade, because it is a lot cheaper than Pedialyte ($1-2/liter), but it usually contains a lot more dyes and flavorings and is not as effective. If you use Pedialyte, Trioral, or Normalyte unflavored versions you can mix in other powders to give you a bigger electrolyte boost, if you need it. I usually wake up and drink 1.5 liters with one Trioral packet, one Vega scoop, and one scoop of my magnesium powder before getting out of bed, which really helps with the dehydration from sleeping! Note: Mix and match under a doctor’s supervision. Follow salt and potassium recommendations given by your physician. 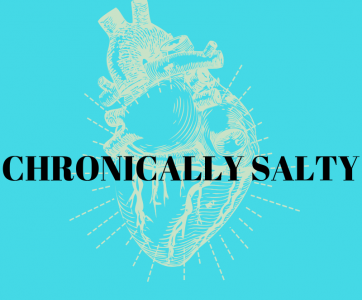 For more information on summer heat techniques and flare recovery, check out my other articles on Chronically Salty! Thanks for all of the tips! I love LyteShow and carry the bottle around with me everywhere. Since it kinda just tastes like salt water, I put it in anything liquid. Thanks for the read! I’ll definitely look into it!